Hello, hello, hello. How are you ladies today? Oh my gosh – I am so excited to be doing this podcast today. First – I hope you had a wonderful holiday. I think back to when I was a kid and the magic of Christmas. Believing.. it’s so funny because my sister was just saying my “believing” is on point – lol.. We don’t decorate much at our house – honestly b/c we don’t have kids and we are getting older so it is just simple for us. BUT – I do have a couple of those “believe” decorations around..lol.. I do think it is important to believe. And believing is what I want to talk to you about today. I have to be honest – this was a concept I don’t think I fully “got” when I was doing the work for drinking less. I mean, I did get it intellectually, but I don’t think I REALLY got it. So for me, using the planning tools worked best when I started doing the work of drinking less. I do love me a good check, and my brain has been programmed to hit sales goals so the planning was key back then. What I am talking about in this podcast is another tool that may work for you. And it is a concept I continue to work on because for any goal we must believe. So today I want to share the idea and give you an example of something outside of drinking less and then bring it back – because I REALLY do get it now, and like I’ve said – these tools can be used not only for drinking less – but for sooo many aspects in your life. Which reminds me – please feel free to share this podcast with any BFF you think may benefit. 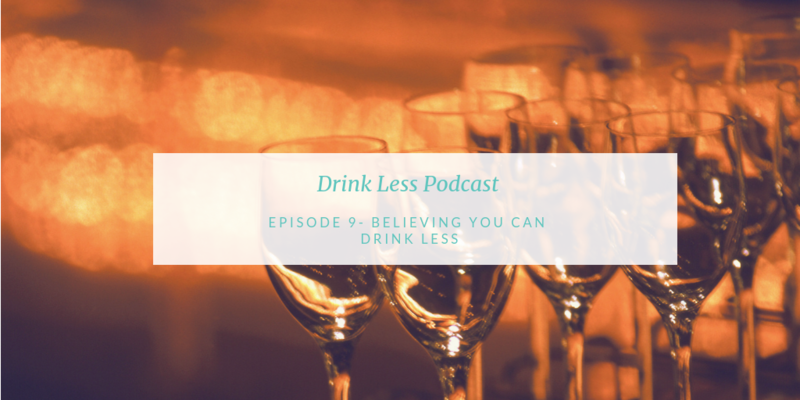 I know it is called Drink Less – but seriously – you can use these tools for accomplishing so many goals. Ok – so – back to my story. Let me tell you – much to my parents chagrin – I have had credit cards for as long as I can remember. Like – lol.. since I was 18 and got my first Fashion Bug card. Yes, I’m that old. And since that card I have always had credit card debt. Lol.. The last time we went for a car loan the guy said – well, I’m not saying you have bad credit.. I’m just saying you have a lot..lol. So you get my story? It’s been a challenge. But this year I got some coaching on my money mindset – which by the way will be a podcast in the future, and with the coaching I started believing I might be able to pay off all the debt by the end of this year. Now – I want to explain something to you. When I started the work on drinking less I wanted to believe I could do it. But something just didn’t’ feel right. And remember – all of our actions come from our feelings. So when we are thinking – I’m not sure if I believe I can do this how do we feel? And now how do you show up? For me – If I’m feeling doubtful I would not have my own back. If I made a plan I wouldn’t always stick to it. – Super side note – if this is where you are – finding you are not sticking to your plan – I will also be doing a future episode on a tool for you to learn and move on.. so stay tuned! Ok – now if I wasn’t believing I could do it, and feeling doubtful, and not sticking to my plan can you guess what the result was? Yes – I wasn’t able to do it. So I started with a thought that was more believable. I did believe I could learn to not want the extra wine. With that thought I felt so much more confident and then my actions were different and eventually I believed I could and did. When I was doing that work I was in a self coaching program. I still self coach every day but I have also been able to now invest in a coach to help me as well. The power of having a coach is that they can show you things you don’t really see going on in your brain. So often we have these beliefs that feel sooo factual. But a belief is just a thought you’ve had over and over and now it is a belief. Beliefs usually come from your past, maybe family or friends. And – it’s like luggage we just keep hauling around. We get to choose if we want to keep believing certain things. Like – do we want to believe you have to be drinking to have fun, or that we always over drink on weekends? The tricky part is – sometimes we have beliefs that we aren’t quite aware that they are beliefs – not facts. And for me – I had a lot of money beliefs that my coach was able to point out where not facts. OH – and if you are interested – one of my coaches..lol.. I have a couple – business, life.. there is a lot going on up in this brain that needs coaching …lol.. So for this example Rhonda helped me. She has a great podcast too – Bedroom Confidence for Good Women – Rhonda Farr. You should check her out. So – once I was aware of these thoughts I could choose not to keep them. Let me tell you – the process of believing went so much faster – and I guess truth be told I have just done so much more work since I’ve learned to drink less – but it FELT so different. So each day I would write down in my gratitude journal Paying off all debt by end of year. AND more importantly when I thought that I really FELT excited… or maybe determined. I think depeding on the day that would change. But – when I’m feeling that way I was so much more focused on accomplishing it. And guess what my friends? As of Nov 30th– all credit card debt is paid off! These tools are crazy ridiculous. It has been 26 years and in just a couple months I believed I could do it, and did. Because you know what happened the past 26 years? I didn’t believe I would ever get it paid off so I pretty much ignored it. Simple shifts in thinking can make so much of a difference. So now – regarding your drinking. I want to encourage you to start writing down what you believe to be true about your drinking. I can not stress how important the writing down is. Heres why – when you write it down you get it out of your head. When we are up in our heads we think its who we are. Its’ not. It’s just the thoughts we are having. Writing it down allows you some space to be able to look at it. Let me tell you – lol.. sometimes when I look at what I’m thinking I’m like – what the hell is that all about…lol..
Now, as you look at it you can decide if it is helping you get the results you want. So, first step is always awareness. Once you do that start playing around with some thoughts that you can believe that would help you make the shift. Try on a couple of thoughts and see which ones you really believe. Think about how you feel when you believe you are going on vacation. You are excited right? Sometimes the excitement leading up is even more that when you actually get there. That is exactly what happened this time with my money goal. And this is what you want as you work to drink less. Seriously – think about why you want to drink less… because you think you will feel a certain way right? So as you think about who you will become – what do you think she would be feeling? When you believe you can achieve that you start showing up like that now, which will lead you to taking actions in the direction to drink less. Everyday when I was writing down I will pay off all my debt – manm I was so excited to imagine it. That’s what you want your belief to be. And you know what – once I actually made that last payment it was like – well, I knew that was going to happen. I actually wasn’t as excited as I thought I would be. I’m telling you. This is so important to believe ahead of time. So many of us kinda have it backwards. We think we will be happy when we start drinking less. You have to start feeling like you think you will then – now. In order to do that you need to start believing you can do that – now. I’m telling you – it works. And let me be clear – there are still new and bigger goals I’m setting for myself that I need to keep doing this work on. Because here’s the thing – when you start believing now, and feeling that way now – you start taking action from a place that will get you there. It’s not always easy – but doing it blows your mind. So listen up – lol.. I sound so official right? But seriously – I want to encourage you – especially with New Years around the corner – think about a goal you want to accomplish. I encourage you to start implementing this tool on a goal that you want in 2019 – lets say to drink less.. I promise you this – when you start doing this and start seeing yourself take action to drink less you can take the skill and apply it to sooo many aspects. That’s why all of this stuff is so amazing – the tools can truly be used for creating the life you imagine. If you haven’t already downloaded the free guide to begin drinking less make sure you head over to mindfulweighs.com/freebie to get started. I wish you an AMAZING new year. I am so excited for all that is ahead and so happy to have you on this ride with me.